Assisted GPS or Augmented GPS (abbreviated generally as A-GPS and less commonly as aGPS) is a system that often significantly improves the startup performance—i.e., time-to-first-fix (TTFF)—of a GPS satellite-based positioning system. A-GPS is extensively used with GPS-capable cellular phones, as its development was accelerated by the U.S. FCC's 911 requirement to make cell phone location data available to emergency call dispatchers. Standalone/self-ruling GPS devices depend solely on information from satellites. A-GPS augments that by using cell tower data to enhance quality and precision when in poor satellite signal conditions. In exceptionally poor signal conditions, for example in urban areas, satellite signals may exhibit multipath propagation where signals skip off structures, or are weakened by meteorological conditions or tree canopy. Some standalone GPS navigators used in poor conditions can't fix a position because of satellite signal fracture and must wait for better satellite reception. A regular GPS unit may need as long as 12.5 minutes (the time needed to download the GPS almanac and ephemerides) to resolve the problem and be able to provide a correct location. An assisted GPS system can address these problems by using external data. Utilizing this system can come at a cost to the user. For billing purposes, network providers often count this as a data access, which can cost money, depending on the plan. To be precise, A-GPS features depend mostly on an internet network or connection to an ISP (or CNP, in the case of CP/mobile-phone device linked to a cellular network provider data service). A mobile (cell phone, smart phone) device with just an L1 front-end radio receiver and no GPS acquisition, tracking, and positioning engine only works when it has an internet connection to an ISP/CNP, where the position fix is calculated offboard the device itself. It doesn't work in areas with no coverage or internet link (or nearby base transceiver station (BTS) towers, in the case on CNP service coverage area). Without one of those resources, it can't connect to the A-GPS servers usually provided by CNPs. On the other hand, a mobile device with a GPS chipset requires no data connection to capture and process GPS data into a position solution, since it receives data directly from the GPS satellites and is able to calculate a position fix itself. However, the availability of a data connection can provide assistance to improve the performance of the GPS chip on the mobile device. Mobile Station Based (MSB): Information used to acquire satellites more quickly. Mobile Station Assisted (MSA): Calculation of position by the server using information from the GPS receiver. The assistance server has a good satellite signal and plentiful computation power, so it can compare fragmentary signals relayed to it. As an additional benefit, in mobile station assisted implementations, the amount of processing and software required for a GPS receiver can be reduced by offloading most of the work onto the assistance server. 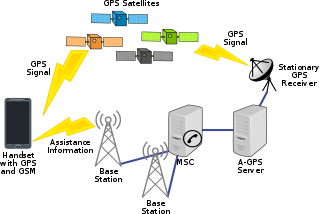 A typical A-GPS-enabled receiver uses a data connection (Internet or other) to contact the assistance server for aGPS information. If it also has functioning autonomous GPS, it may use standalone GPS, which is sometimes slower on time to first fix, but does not depend on the network, and therefore can work beyond network range and without incurring data-usage fees. Some A-GPS devices do not have the option of falling back to standalone or autonomous GPS. Many mobile phones combine A-GPS and other location services, including Wi-Fi Positioning System and cell-site multilateration and sometimes a hybrid positioning system. High-Sensitivity GPS is an allied technology that addresses some of these issues in a way that does not require additional infrastructure. However, unlike some forms of A-GPS, high-sensitivity GPS cannot provide a fix instantaneously when the GPS receiver has been off for some time. A-GPS protocols are part of Positioning Protocol defined by two different standardization bodies, 3GPP and Open Mobile Alliance (OMA). Defined by the 3GPP for various generations of mobile phone systems. These protocols are defined for Circuit Switched Networks. The following positioning protocols have been defined. RRLP – 3GPP defined RRLP or Radio resource location protocol to support positioning protocol on GSM networks. TIA 801 – CDMA2000 family defined this protocol for CDMA 2000 networks. RRC position protocol – 3GPP defined this protocol as part of the RRC standard for UMTS network. LPP – 3GPP defined LPP or LTE positioning protocol for LTE Networks. Defined by the OMA to support positioning protocols in Packet Switched Networks. Two generations of User Plane Protocol have been defined. ^ "Assisted GPS: A Low-Infrastructure Approach". GPS World. March 1, 2002. Retrieved 11 June 2008. ^ "NavCen GPS User. 3.5.3 Almanac Collection" (PDF). Navcen.uscvg.gov. Retrieved 2017-04-02. ^ a b Low, Aloysius. "Phones". CNET. Retrieved 2017-04-02. ^ "iPhone Secrets and iPad Secrets and iPod Touch Secrets". Edepot.com. 2010-09-30. Retrieved 2017-04-02. ^ "GPS vs. aGPS: A Quick Tutorial | Windows Central". Wpcentral.com. 2009-01-03. Retrieved 2017-04-02.